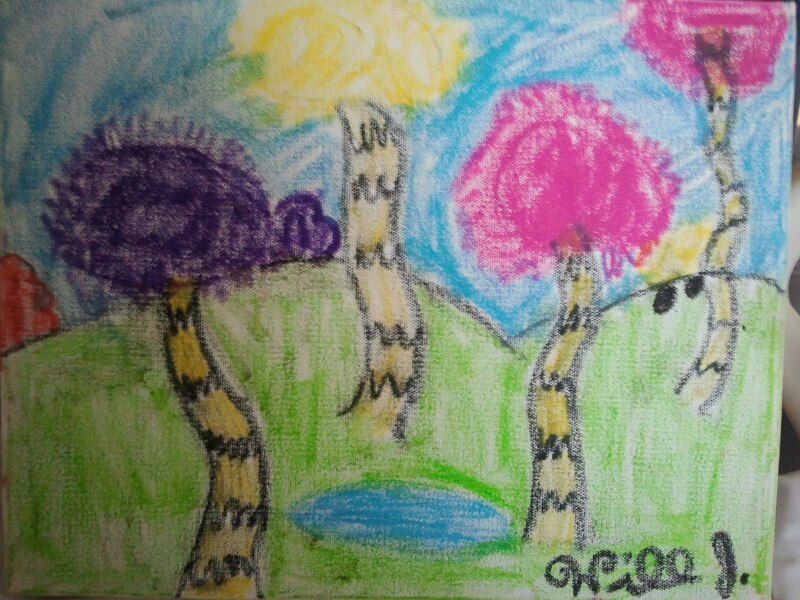 *picture created by Will who attends our church with his family - he said he made most of the trees pink and purple because Evelyn always wears those colors. 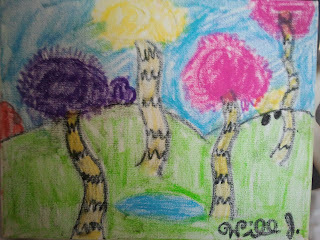 I think Will is a true artist in the making. When the Red Hot Chili Peppers wrote that song, I doubt they intended for the title to be interpreted the way I'm about to, but oh well. I think that our love for Evelyn causes us to ride the rollercoaster of life with her - including this hospital stay. On days when she's making good progress, feeling 'better' and looking like her sweet self, we're up. On days when she's not feeling so hot, we're down. Yesterday afternoon and evening were pretty 'down' for Evelyn and me. Evs continues to make great progress with trach healing and breathing independently, and Daniel and I are learning and practicing and feeling good about caring for her properly when we come home. Unfortunately, for no clear reason other than the stress of the surgery and extra medications, Evelyn has developed a mild case of pancreatitis. This is basically an inflammation of the pancreas, and is treated with stomach/bowel rest, and rest in general. It can be pretty painful, and has been bothering Evelyn some periodically throughout the last few days. Yesterday we moved down to the TICU, and between stomach pain and other tummy issues Evs just didn't seem happy. She also had a lot of trouble sleeping last night; didn't really go to sleep until around 3am and was up again at 6. Because of her other tummy trouble the nurses and I were worried she might've contracted c-diff (a very nasty intestinal bacteria) - luckily she did not. But, prior to learning she was in the clear, Evs and I were both rolling downhill at top speed from all the sleep deprivation and worry (and in Evelyn's case, all the discomfort). It was one of those evenings where you're not very proud of yourself, because you feel so tired and so worried and so, basically, selfish in your fear that you lose all perspective. The great gift though, is that in the midst of riding this rollercoaster it becomes so clear how steady God's presence is. Our weakness of spirit may cause us to ride the waves of our emotions, but we can rest a little easier knowing there is always a steady hand on our shoulder. I'm not proud of my imperfections, but I'm thankful that sometimes feeling so ridiculously miserable gives me a chance to see God more clearly, and be reassured. Evelyn has had a better day today, and so have I. Pop and CC visited with Evs while Daniel and I took Owen to lunch and to the park (beautiful weather! ), and then Owen and I came back to their house and both napped. Evs hung out with her Daddy, and is still not feeling super fabulous, but slowly the pancreatic enzymes are moving toward the normal range - and as they do so her discomfort should lessen. Thank you so much to everyone who is praying, and thank you to those who have called or visited as well. It is so nice to see a friendly face walk into your hospital room, and I know it helps Evelyn to feel loved and supported, and to remind her that there is an end to this hospital stay and a life outside waiting for her. Tomorrow I will be with Owen in the morning, then Auntie RoRo and Aunt Megan will hang with our children while Daniel and I go home to set up new storage for all Evelyn's accessories, and make more meals for her. I will be at the hospital Sunday night and Monday, and I'm looking forward to helping Evelyn get through these next couple days, bugging the doctors to keep us moving in the right direction, and getting one day closer to being at home again.